I am so pleased with how this girl matured, in looks and performance.She has sweetened up quite a bit...Im very happy with her indeed. LOOKING for a Pet home. Emmy doesn't give a ton of milk but would be great for those not needing much. More info on sale page. This girls Name suits her..she is regal...royalty and she knows it!! Her lineage also carries LA ST +*B With Kastdemur, Dreamy Delights and Teats and Tail...I know she's a prize!! Had her LA 2013 and scored 85. A dream milker. Easy flow teats, nice capacity. And a sweet personality! Not to mention a great mom. Our First F1 mini Saanen doe. 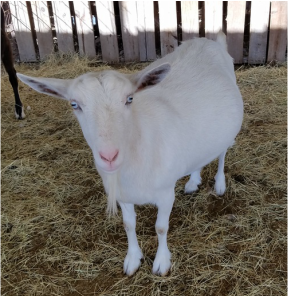 Pretty Irene has blue eyes and a personality to match her Saanen side. Absolutely love this girl. Daisy is Jessicas pet goat. She favors the boer in her. She is a naturally polled pain in the bootie, but we love her. Martha is a sweet gentle girl. This gal is an amazing milker..throws amazing kids and is sweet to boot. We love Marie! We adore this little angel. Such a good mom and gentle herd mate. She does pretty good on the milk stand too. LuLu Is a wonderful mom and beautiful girl. We hope one day she allows more affection. We sure hope to milk her !